Toxin Tre1 attacks competing bacteria by a mechanism similar to the way pertussis, cholera and diphtheria toxins target people. 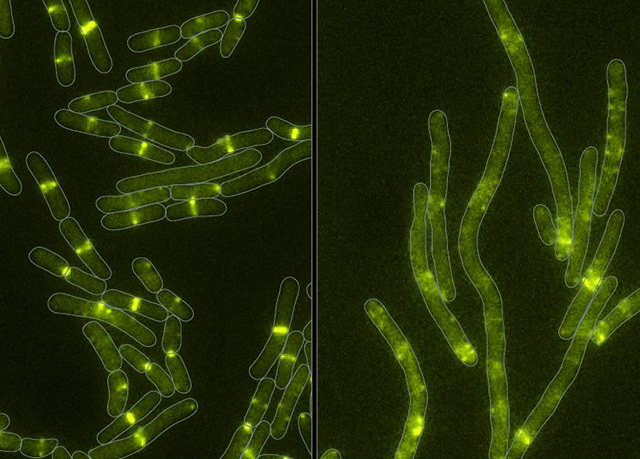 Healthy bacteria (left) and bacteria (right) whose cell-division machinery has been disrupted by a toxin newly discovered in some bacterial arsenals. The title of the Cell paper reporting this research is, “Bifunctional immunity proteins protect bacteria against FtsZ-targeting ADP-ribosylating toxins.” The lead author of the paper is See-Yeun Ting, of the UW School of Medicine Department of Microbiology. Researchers from the departments of pathology, physics, and bioengineering also contributed to the work. The work was supported by National Institute of Health grants to the Northwestern Proteomics Core Facility and to the University of Washington Proteomics Resource. Parts of the study took place at the Advanced Light Source, a Department of Energy User Facility at Lawrence Berkeley National Laboratory. Mougous is a Howard Hughes Medical Institute Investigator.